Here is a great article on how much salt versus pond plants. Very in depth with a chart. 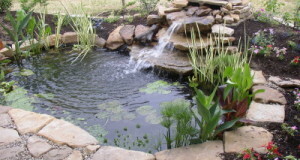 About 1.6 to 3.2 pounds of pond salt per 100 gallons of water is the recommended dose for a stable salt level, up to 4 lbs of salt per 100 gallons as a preventative salt therapy to help defend against parasites. You may want to lean towards the lower end of the recommended dosage if you experience a lot of evaporation. It is a good idea to have a pond salinity kit available to monitor the levels, ecpecially in summer heat and if you don’t get frequent rainfall. Will you please tell me how much salt to use in a 750 gallon pond? Hello Tam, As we recommended to the commenter before you, about 1.6 to 3.2 pounds of pond salt per 100 gallons of water is the recommended dose for a stable salt level, up to 4 lbs of salt per 100 gallons as a preventative salt therapy to help defend against parasites. That would put the lower range recommendation at 12 pounds for a 750 gallon pond.